​"Big Bear Equestrian Center & Bear Valley Farms"
"Being an owner of both the Farm and Big Bear Vacations, we naturally are combining the experience to create many packages. 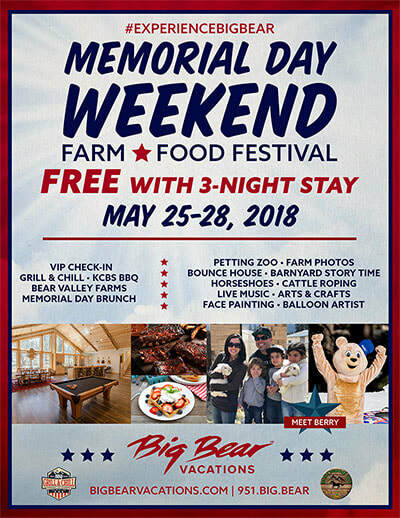 We invite our guests to enjoy the farm during their stay and we offer free admission to the Farm if you stay with Big Bear Vacations as a starting promotion." Visit "About Us" to read more about the story on how the farm came to be. FREE admission with a 3-night stay! Big Bear Vacations is proud to celebrate 20 years of making lifetime memories for our guest. We understand that it’s the mountain lifestyle bringing our guests back to this amazing area each season. Our team will help you create the ultimate Big Bear experience. Choose from more than 300 homes and cabins ranging from rustic and simple to luxurious and grand. Big Bear Vacations offers a wide selection of locations including lakefront, walk to slopes, secluded next to the national forest, close to the village, and mountain top. Each property has a variety of amenities, decor, and pricing. We have the perfect accommodations for you, your family, friends or group.